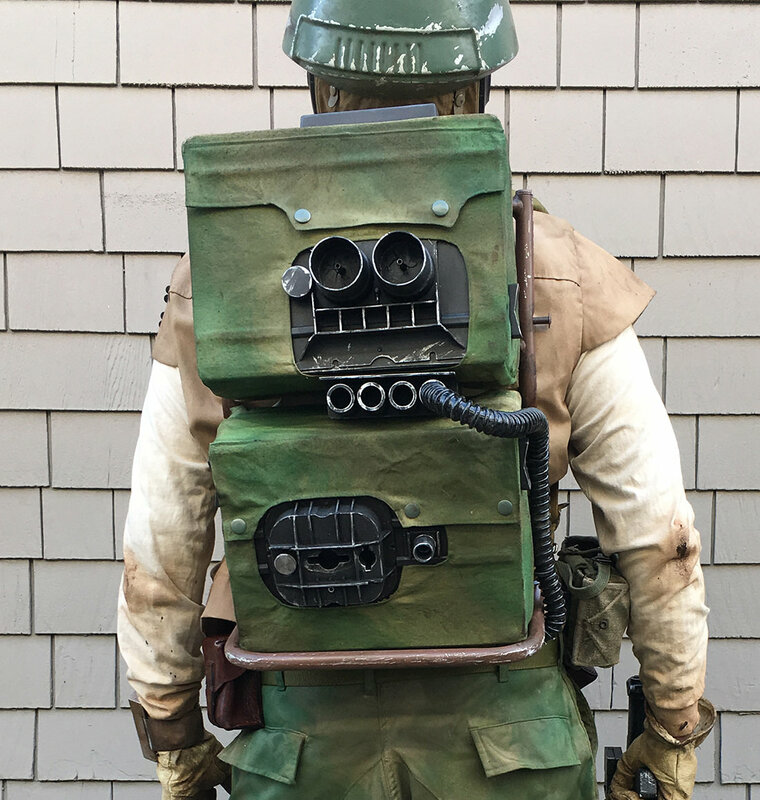 I was just approved with my new Endor Rebel Trooper, and a few people have asked if I have a build tutorial for the hard pack (two-box pack). I took some photos as I went for just this purpose, so I am happy to share how I built it. If the pics look small, clicking on them should pop them out in a window you can zoom in. The Endor Hard Pack is very iconic, and it first was used on the Hoth Troopers. In the costume book, they state that they re-used these and painted them, so they are essentially the same pack, just missing the side antenna mount and hose. The pic on the right from the costume book shows that this prop is missing the four tube mount from between the packs, and you can see the missing paint and screw holes from where it was. They appear to be built on top of a plastic box with raised edge seams on teh sides, and raised ridges across the lid that peek through on the sides of the greeblies, and show as a bump on the top box flap. Things I learned intimately studying these packs: The top flap and "handle" are not centered, but in line with the upper greeblie piece. The flaps are not functional, they are just tacked on top with snaps added. The cloth box must open on the frame side to put the boxes in. Look at the seams in the cloth, the "face" of the boxes is the bottom of the one-piece cloth box that is sewn. The frame is bent between the boxes to give it the distinctive shape and to allow for the wedge that holds the vent tubes (also not in the center), but backpack frames do not have this bend so it must be added. This pack shows up on Hoth, Endor, and Pao in Rogue One has a version of this pack too. Nobody is sure what the pack does, as it has conflicting descriptions. As people on this forum have found, there are many antique backpack frames that match this look. To adapt it to this pack, you must bend the tubes between the boxes to a 15 degree angle, and then hacksaw the upper bars off and use the plugs from those to plug the lower holes. The internet gave me a great method for bending the tube. Use a funnel and pack the frame with sandbox or beach sand. Keep shaking it and adding more until it is truly packed. Leave the upper bars on for leverage, and tape the plugs on so it is solid with sand. Use a simple handheld propane torch to heat the two spots going back and forth until they seem hot enough. Bend it over a rounded edge (mine was a little too sharp workbench edge, Try a large handrail dowel attached to the bench) and bend it. Then just pour out the sand, cut the top bars off, and re-plug the holes. Then I primed it, and painted it brown, and then weathered it and scratched it up. The straps were the same style as the prop, but mine were coyote beige. I did a weak Rit dye bath with dark green, and came out with a good olive color. I found on the forums that "The fan research community thinks each box is approximately: 12 inches wide, 8.0 inches tall, and 4.5 inches deep." Judging by some of the reference, I think it may be more like 5.5" inches deep, but this is close. I couldn't for the life of me find any plastic bins that were the right size even doubled up. I did find these basswood boxes that were. They were only about 3" deep, so I bought three, glued one closed, cut it in half, and glued each half to the others so I ended up with two boxes the right dimensions. They could still "open" which helped for mounting a few of the greeblies with bolts from the back. Being in the cloth holds them shut. To mimid the raised seam from the movies, I bought a replacement flat appliance cord, and glued and screwed it around the mid line. I knew I would need a plastic face, so I cut an old blue lid from a storage bin to cover the face. This was the most time-intensive aspect of the project. If you are not comfortable with sewing, it helps to at least have someone who is walk you through what to do. It is a simple shape, but it has to be done in the right order. I drew out my pattern on paper, and cut it out and folded it over the actual boxes to make sure it would work, and caught a few issues this way. I highly recommend trying it on first, and then using that for your pattern. You can ignore the box "seam" in your plans, and the cloth will stretch around it and look just like the movie packs. I settled on closing them up with velcro flaps around three edges and velcro on the "top" flap. This allowed me to put the boxes in and out during the process, but once I attached the boxes, screws make them no longer open at the end. Cutting the holes must be done just right, so put the boxes in, and then place the greeblies, and make a template in thick paper for them. This template is used to mark the holes to cut (cut smaller, so you can roll the hem back with some small snips on rounded edges and sew the edge). It is also used to position and mount the greeblies on the boxes, so they will line up with your holes. Once you have this done, you can make the pattern for the "flaps" shown here in brown paper, which get added after the holes are sewn, but before they are painted. I primed and painted the tops of the snaps before setting them. The "flaps" are non-functional to the pack, and you can see they are just added on top in the movie props. I had to time this all to be done, so I could paint the pants and the box covers at the same time because they use the same paints. Be sure and keep your boxes in the cloth to avoid wrinkles, and lift up the flaps to get paint under the edges. The paints are the Design Master paints used on all Endor cammo (Moss Green (heavy), Holiday Green (light), Hunter Green (light), Basil (heavy...primary color), Bright Olive - (small accents) but I couldn't find this last color). I am not sure how others do this, but I didn't think the vent tube greeblie should just support the top box on its own. I took measurements, and then took a scrap of 2x6 redwood and cut the shape. I cut two channels into it where the box seams would go, so it wouldn't push the boxes apart. I screwed the resin greeblie to it, and then primed and painted it. It has two pre-drilled holes to mount it to the upper box. 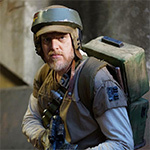 (note, on Pao's backpack in Rogue One, this part is contained within the cloth cover of the top box, so that pack might a little trickier to sew). A note on these greeblies: I spent months searching junkyards and hardware stores for a way to build these. I could do the upper part with some plumbing bits and the pill case people use, but it was a bit more complex than those usually look. I spent those same months looking for a vendor or 3D print file for these, and there was nothing. 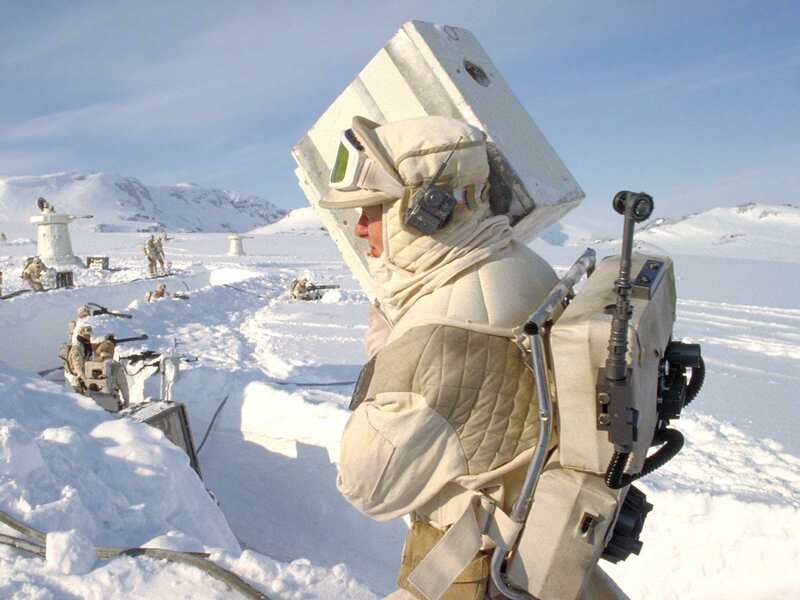 Then I thought to search for "Hoth Pack greeblies" and eventually found a Rebel Legion member in Denmark (his group has great Hoth Trooper costumes) who had a pic of them in his "Imperial Skunk Works" page photo gallery. I messaged him, and he was able to produce them. He 3D prints the lower greeblie, hand cuts and assembles the upper one, and also has some resin casts for the three side "switch" greeblies. He was a great help at a reasonable cost, and I have encouraged him to put at least that lower piece on Etsy for people to buy. He is looking in to it. I added this blue plastic from a storage tub lid so that it would have plastic texture instead of wood. I sanded the plastic, and used the E6000 glue and screws to mount it to the box. After I used the same glue to mount the greeblies to the box. I also took very small round-top flat head screws and mounted them down to the box lid, so there would be something sturdier than glue holding them on. One thing I have found is the pack sticks out more than you think, and you will be bumping this into things at crowded cons. I recommend using tiny backup screws where possible, and flat head if showing (Lucas appeared to never show phillips screws on props that I could find). The two upper large tubes protruded past the backing, so I cut two corresponding holes in the blue plastic so the piece would mount flush. I cut the visible raised strips from the bottom of an old plastic bin, and used wood for the one that is not visible. The silver knob is a drawer pull mounted through the greeblie from inside the box. Primed in black, painted with the Charcoal Gray chalked paint, and then used black acrylic in the cracks and wiped away to get grime in there. Dry-brushed silver model paint on all edges that might have been scuffed through wear. I did the side "switches" at the same time to match. This took a while to find a good corrugated tube. I finally settled on a pond tube from Home Depot, 3/4" Inner Diameter. I had to use a small belt sander to grind down the part that gets inserted into the tube greeblie. This made it thin. I wanted to mount it securely and give it more strength, so I took two 1.25" long pieces of dowel, and glued them into the ends of the tubes. This both strengthened the ends, and gave me something to drill into. I drilled a small hole in the side of the vent tube greeblie, and also in the dowel, and put a smalls screw in from the side so it is mounted in place. There are a few pics I have found that show the tube running down the frame-side of the middle seam, with about two mounting points where it changes direction. I used some ends from cut off zip ties to create black plastic loops that were mounted to the frame. It goes in to the bottom of the box on one side. I used a piece of pvc threaded reducer bushing, painted Charcoal gray, and inserted into the box. A long screw goes from the outside of the cloth box, through the bushing and the tube and dowel (all inside the box, so pre-drill them to line up) to secure it to the box. Some people use Velcro, but I was not ready for more sewing at this stage. I settled on using some plastic 1/4" coaxial clamps and some black zip ties to attach it. I set the boxes in place, and then marked where to pre-drill the holes. Be careful drilling through cloth, as it will often catch and twist the fabric. Try drilling in reverse for a bit to cut through the cloth before drilling the wood. It was quite the project, and feels a little like the step in the jedi training where they must build their own lightsaber to complete their journey. I picked it because I loved how it looked, and it wasn't something that was easy to figure out. Hopefully my tutorial will help more people attempt this pack! For the backpack greeblies, those would not be really hard to model in 3D to print. I might come to this at some point. But hardback is the last thing I will do in the costume so will not be before a couple of month ! Although there is not really a consensus on what this pack does, I found an intriguing idea that a Rogue One concept artist created. He calls it a "Hack Pack" and it looks pretty cool as some kind of data device (though the flaps are not really how it would open on the bottom box). As an aside, I was watching Rogue One again, and the cable pack that the pilot uses has the same lower section of these packs. So they are some kind of electrical/tech pack of some kind. Having a comms uplink more powerful than a wrist watch would make sense. Odds on you'd have ewoks all over you with this, retuning it to watch cartoons. Someone asked for more clarification on how I constructed the fabric covers. This is a sort of quick sketch of how they are built. The velcro closure side gets put against the frame, and with screws and stuff ends up being more permanently sealed when finished. Great illustration! Interesting design on how the opening is in the back and the flap is false/for decoration. 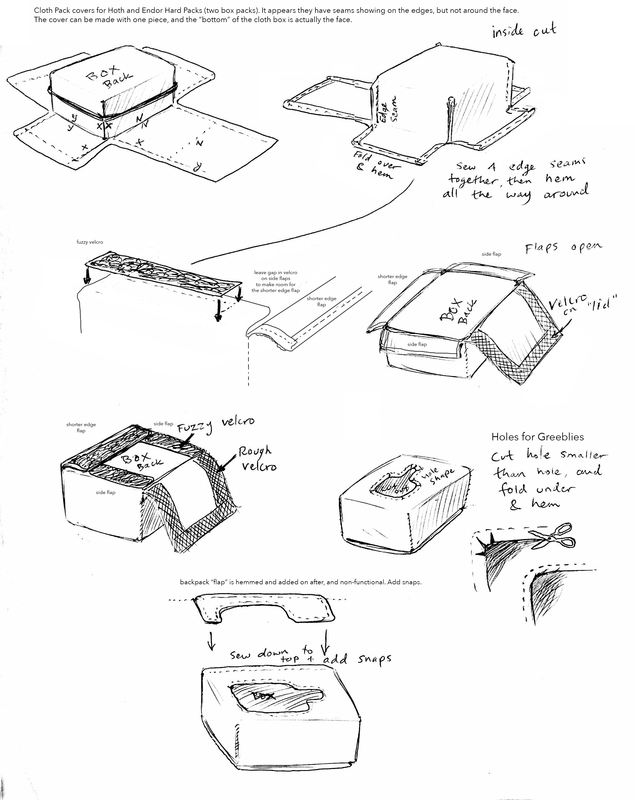 When I do mine I'm going to try and make the flaps functional.